JAZZ DUO/TRIO (with Martin Kratochvil - piano, and Imram Musa Zangi - percussion): This trio has been a staple of the Czech jazz scene for decades. See description below. 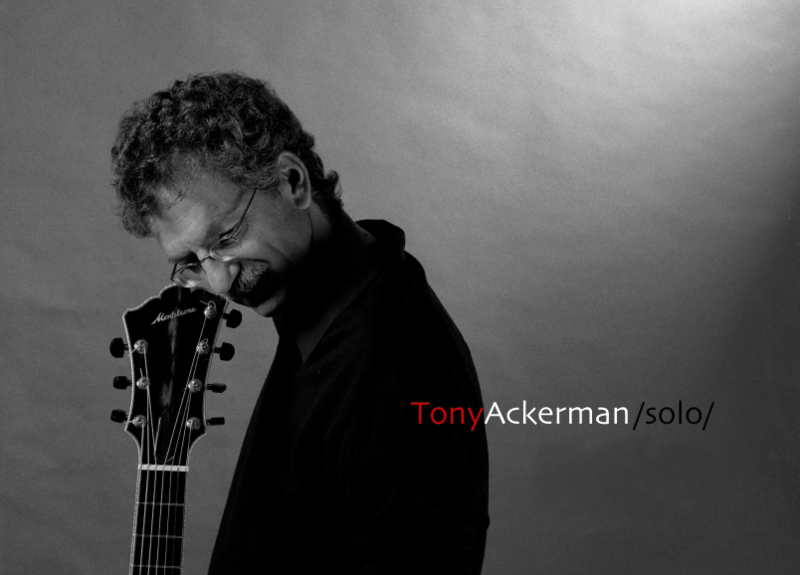 TONY ACKERMAN + ZDENEK JAHODA (mandolin): Tony teams up with the Czech Republic's greatest mandolin player, fusing the strings in many styles from bluegrass and blues to bossa nova. Americký virtuózní kytarista Tony Ackerman zije ve Ceske Republice tricet let. V jazzove duo s Martinem Kratochvilem hral tisice koncertu nejen u nas, ale po Evrope, v USA, a na blizkem Vychode -- a spolu maji nahrano devet LP. U nas v ______________, Ackerman představí fascinující sólový večer na pěti akustických kytarách. V první polovině večera čerpá ze svých hudebních kořenů v různých amerických stylech - folk, bluegrass, blues a ragtime. V druhé části večera pokračuje klasickou kytarou, brazilskou bosanovou, a na závěr hraje své originální skladby a improvizace, které jsou inspirovány hudebními styly z celého světa. Americký kytarista Tony Ackerman zije ve Ceske Republice tricet let. V jazzove duo s Martinem Kratochvilem hral tisice koncertu nejen u nas, ale po Evrope, v USA, a na blizkem Vychode -- a spolu maji nahrano devet LP. Nedavno Tony zacal dalsi spolupraci, tento krat se spickovem mandolinistou Zdenkem Jahodou (vyhercem ruznych cen za vykony ve bluegrassovym stylu -- vcetne v Nashville, USA). 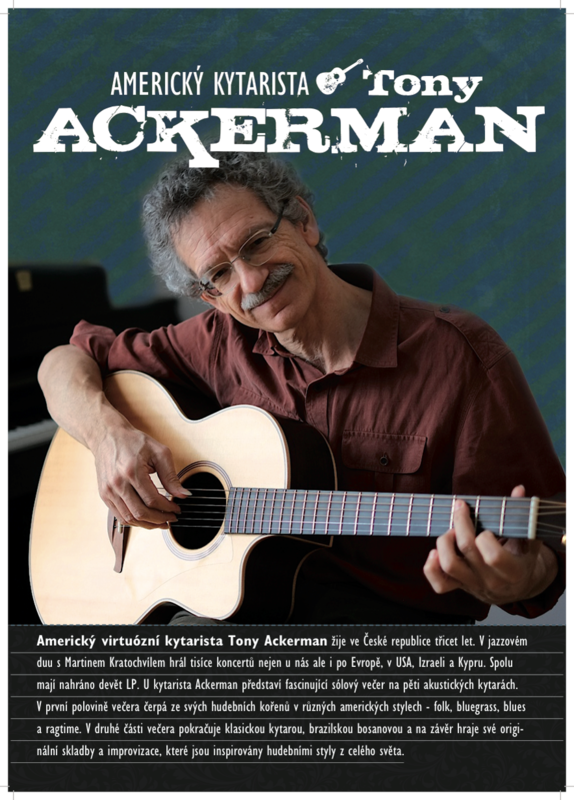 Zakladem je Ackermanova hra na pěti akustických kytarách, ktera zacina od americkeho “roots” music (cernossky blues a ragtime, belossky country a bluegrass) a pokracuje pres swing, bossa nova a moderni jazz do zcela volnych improvizacich. Zvuk dvouch strunnych nastroju se krasne prolina, a vytvori krasne nove hudebni svety. The trio of Martin Kratochvil (piano), Tony Ackerman (7-string guitar) and Imram Musa Zangi (percussion) has been a staple of the Prague jazz scene for over 25 years. Their unique sound combines elements of their three native countries (Czech Republic, USA, Iran) with the raw energy of jazz improvisation and the easy familiarity of a half a lifetime of playing together. Kratochvil was the first musician to bring jazz/rock behind the Iron Curtain in the early 1970's, and his jazz/rock group Jazz Q Praha still draws big crowds today. He was also the first Czech to attend the prestigious Berklee College of Music in Boston, the most prestigious jazz university; he now divides his time between live music, trekking in the Himalayas, and making films of his adventurous journeys. 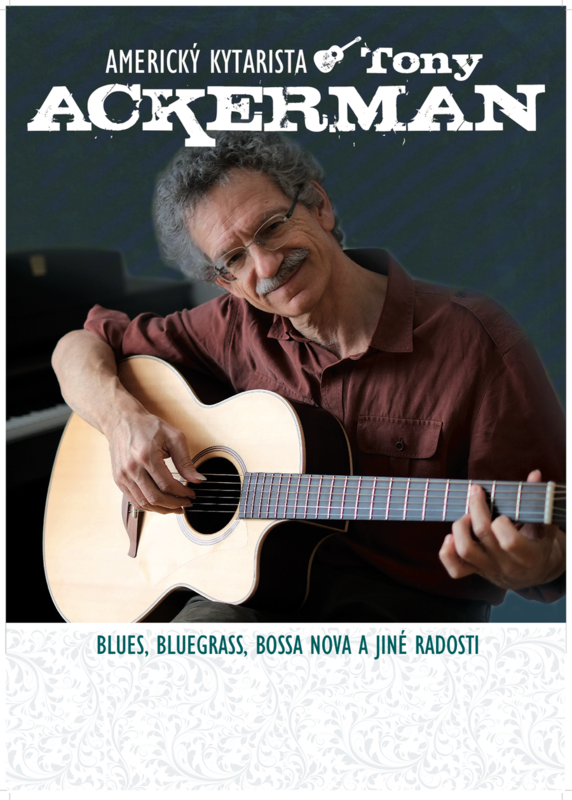 Ackerman learned all the current folk and blues styles as a teenager in the Boston area, and honed his guitar skills with several years of classical study. His custom made 7-string guitar provides a rounded, natural sound to complement the grand piano and ethnic percussion. Imran Musa Zangi plays on a very personal set of congas, bongos, and a whole battery of small percussion instruments to lend not only rhythmic intricacy, but also a great range of ethnic colors, to the group. In their concert you will hear the three go from sweet, melodic openings to highly charged, rhythmically intricate free passages; because their music is so eclectic and has drawn on so many folk and world music roots as well as jazz, it has a way of speaking to people of all ages and musical tastes.